We are approaching the SEN reform legislative finish line with Parliamentary approval of the new SEND Code of Practice so close I can feel its breath on the back of my neck. It is, of course not really a finish line at all but an entirely different metaphor - that of a rocket launch. People up and down the country have been working on assembling the different parts of the reforms, testing out what works, what doesn't and what needs more thought to make it fit the vision. Many would say that in these reforms, that last part is still a work in progress. Indeed, details such as looking at a way for a single path to appeal for the health and care aspects of an EHCP, to match that of the education part is still being looked at, I understand. The Children & Families Act and Code of Practice will no doubt be tested in the courts before too long as is virtually inevitable with reforms that have, as predicted some time ago, been a freight train that has not been derailed. 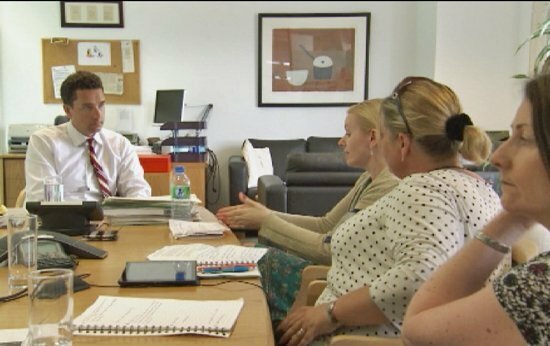 Very recently, I went to the Department for Education along with Debs to meet again with the SEN Minister, Edward Timpson. We invited Steph Curtis of Steph's Two Girls blog to come along with us as her daughter has a prototype EHCP already. We first met Steph at the start of last year, the first time we met the Minister [along with several other SEN bloggers, including Renata and Steph Nimmo] and since then she has become an increasingly strong voice advocating for girls with Pathological Demand Avoidance, an autism sub-set. Special Needs Jungle is delighted to be working on a project with the DfE helping to explain the reforms to parents and we are developing a number of resources, along with this video. We're not paid for our time on this project and remain thoroughly independent. I'm also involved in collaborating on a document to explain the Code of Practice to parents, that is being written by the DfE. SNJ is involved alongside reps from Contact a Family, National Parent Partnership Network and IPSEA and we are delighted to be included helping to ensure that parents know what the changes mean for them and their children. We videoed the meeting we have with Mr Timpson and I've cut together an eight minute segment here for you to see. We are very possibly going to update this post during the day. Stay tuned. As a parent of a child with a statement if special educational needs I am dismayed at not having received any informationfrom the local authority about the reforms ir to ascertain my views.